Home > News > AV Equipment > THE NEW SAMSUNG ME95C – 95″ LED DISPLAY SCREENS ARRIVE AT HQ, AVAILABLE FOR HIRE NOW! THE NEW SAMSUNG ME95C – 95″ LED DISPLAY SCREENS ARRIVE AT HQ, AVAILABLE FOR HIRE NOW! London audio visual recommend these large format displays for conferences, exhibitions, shop window displays and product launches. Samsung ME95C LFDs with edge LED technology are ideal marketing solutions to lure shoppers and clients into your upscale store while heightening brand awareness. Wow shoppers with fabulous, life-size digital videos and images of models walking down the runway or store merchandise on the world’s first 95-inch large format display in brilliant FHD. 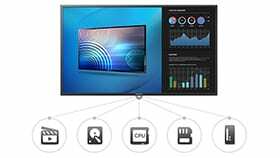 Samsung Smart Signage Platform (SSSP) is embedded within Samsung displays, providing the power of a dual-core CPU and a combination of media player and integrated display solution, MagicInfo™ Premium S player. The solution eliminates the need for additional PC modules, making installation and maintenance easier by providing all the necessary functions for display operation in a single display. These large screens are perfect for conferences, events and exhibitions, our screens are supplied with SL75 motorized stand to gain maximum impact. The ScreenLifter 75 is specially made for the latest light-weight displays from 70″ to 110″ from almost all manufacturers. The lifting system can be provided with different base plates e.g. rolling-carts, “pop-out” box or with mounting kit for fix installation directly on the floor.